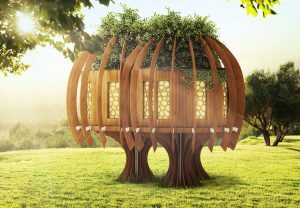 The Enchanted Playhouse is a fairy-tale retreat for your imaginations to explore, offering a unique outdoor space for play. One of our most popular tree house designs, The Enchanted Playhouse is finished in a combination of hand-cut Cedar shingles and Cedar tongue and groove lining and looks fantastic when nestled amongst garden trees and shrubs. There is plenty of space inside for the children to keep their favourite toys, play with friends or sit with a story book in the comfy window seat. Those with an eye for detail will spot numerous other bespoke touches, including an engineered Oak floor, intricate rope work and a copper roof. Please call our friendly team for more information? Call 01892 750090. Our office hours are 9am – 5pm Monday to Friday. Outside these hours, please leave us a message advising us of a convenient time to call you back. Prices quoted in pounds (£) include VAT at 20% and a provisional sum for delivery and installation within England and Wales. We reserve the right to adjust delivery and installation costs following a site visit. There will be additional charges for delivery and installation outside England and Wales. These will be quoted separately based on your location within the Rest of the UK or Europe. These prices are based on our standard size structure, the surrounding timber deck and accessories (including play equipment) are not included within these prices as they are tailored to your requirements. We offer a full range of accessories and we would be delighted to quote for your bespoke requirements. To discuss accessory options and your bespoke requirements, please contact a member of the team on +44 (0) 1892 750090.